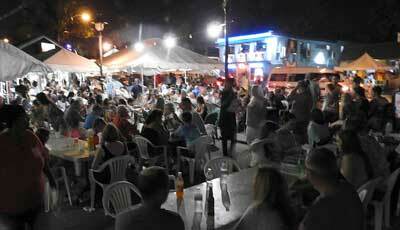 If your visit to Barbados includes a Friday night, you don’t want to miss the Oistins Fish Fry. It’s a ‘must visit‘ during your stay in Barbados. Located in the parish of Christ Church, on the south coast of Barbados, Oistins is an active fishing town, but on Friday and Saturday nights it comes alive for this longstanding Barbadian tradition. This is a popular destination for tourists and locals alike and is the second highest-rated attraction in Barbados. It begins in the evening and lasts late into the night. I suggest getting there early (before 7 p.m.) because the tables fill fast. If you’re late, you’ll have more of a challenge to find a table and your wait for food will be longer. There are 80 or so food stalls preparing some of the best local food you’ll find on the island. Dishes include tuna, swordfish, marlin, mahi-mahi, kingfish, flying fish, lobster, pork chops, ribs and chicken along with fish cakes, sweet potato, macaroni pie, and coleslaw and so much more. 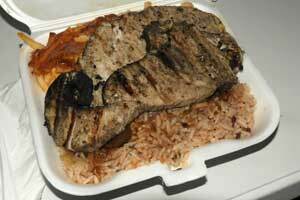 You can get your fish grilled or fried depending on which vendor you choose from. A generous plate of fish and a beer will cost you about Bds$30 – $35 (US$ 15 – 17.50). When I was there I had the swordfish on a bed of rice with macaroni pie at “Pat’s Place” and would have to say it was the best meal I had on the island. If you’re sitting near the main stage in the middle of the complex you’ll find DJs pumping out high-volume music while many take to the stage for impromptu dancing, making for a memorable evening in a casual setting. The party crowd shows up between 8pm and 10pm. It’s loud near the stage so don’t expect much conversation during your meal. Traffic on the road leading to Oistins can get pretty heavy on the weekends so you’ll want to give yourself plenty of time to get there. If you’re driving your own car, it can be difficult finding a parking spot. Alternatively, you can take one of the many buses or taxi’s that can drop you off in the center of activity. Look for any of the buses marked “Oistins”. Barbados has a pretty good public transit system with buses running routes all over the island. You’ll notice many blue (Government run Barbados Transport Board buses) and yellow (privately owned mini-buses) on the road and generally there’s not more than a few minutes wait at the many bus stops for the more popular routes. And get this… it’s only a BDS $2 ($1 USD) fare to ride the bus on all routes. There are also the smaller privately owned ZR vans that runs the local bus routes and costs the same as the blue and yellow buses. 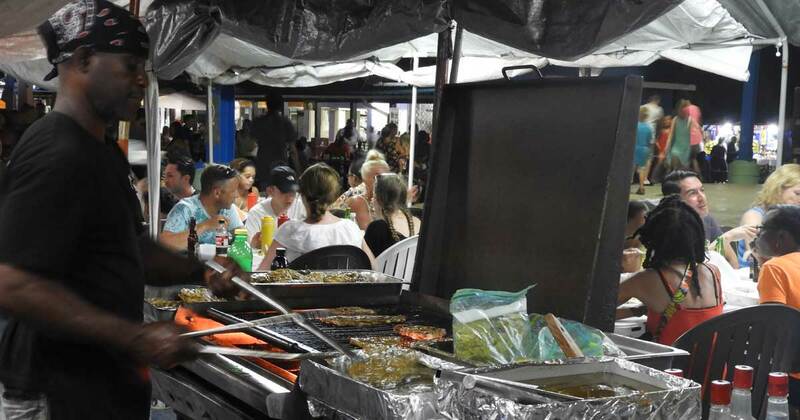 After you’ve enjoyed your meal, be sure to stroll through the area behind the fish fry where numerous vendors set up craft stalls selling locally produced goods at reasonable prices – handmade bags, beach wraps, clothes, jewelry and other souvenirs or unique gifts for loved ones. There’s also an area where the local residents gather to play dominoes and cards. 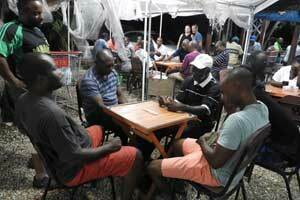 Dominoes is popular across the island and one game you won’t miss seeing in Barbados because it’s played everywhere. “Slamming a dom” has been a favorite pastime for Bajans for generations.